Guns and Guerilla Girls - a text layout/formatting and index project done for the sister companies, Africa World Press and The Red Sea Press, Trenton New Jersey. The book is listed for order on the companies’ website- http://www.africaworldpressbooks.com/servlet/StoreFront and is also available for purchase on major online retail stores including amazon.com and Barnes and Noble. 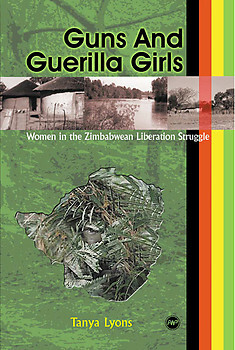 Guns and Guerilla Girls: Women in the Zimbabwean Liberation Struggle is about women guerilla fighters in the Zimbabwean National Liberation war (1965-1980). It provides an examination of the plethora of representations of women who joined the struggle for national independence and contributes to a feminist understanding of Zimbabwe and African history and politics. Most previously published accounts about women’s roles in the Zimbabwean liberation struggle have tended to focus on their “feminine” or “natural” roles as mothers or alternatively on the post-independence concerns expressed by women in Zimbabwe. Both of these views have ignored and excluded women’s actual experiences of guerilla fighting. Guns and Guerilla Girls is the first text to both challenge the representations of “women as warriors” and provide a space for women ex-combatants in Zimbabwe to re-present their past and their histories. The text is also original in its aim to create a dialogue within postcolonial discourse in order to facilitate understanding and healing vis-à-vis women’s war time experiences. The book deals specifically with the case of the Zimbabwean liberation struggle, and provides an in-depth analysis of the different experiences women have of war when they take up arms to fight for their nation and liberation. The text allows women to describe their own history while providing a detailed analysis of the history of the struggle from a gendered perspective. TANYA LYONS is a lecturer on the Globalization Program at Flinders University – Adelaide – Australia, where she specializes in teaching African Studies. She has a PhD in Politics from the University of Adelaide, South Australia, and is currently the Secretary of the African Studies Association of Australia and the Pacific (AFSAAP). She spent 12 months researching this book in Zimbabwe and has published various articles on the experiences of women in the liberation struggle in Zimbabwe.